Pistols, swords, hammers, cannons….wait, hammers? Yes dear reader, one might not expect to find hammers on a pirate ship, but life at sea was not just about rum and booty; it was also about staying afloat in potentially rough seas for long periods of time. As you can imagine, all manner of tools would be required for this feat, hammers among them. Hammers have been used for centuries for many purposes, from driving nails and wooden pins, positioning barrel hoops, to pounding home large wooden pegs that were used to hold together ship frames. 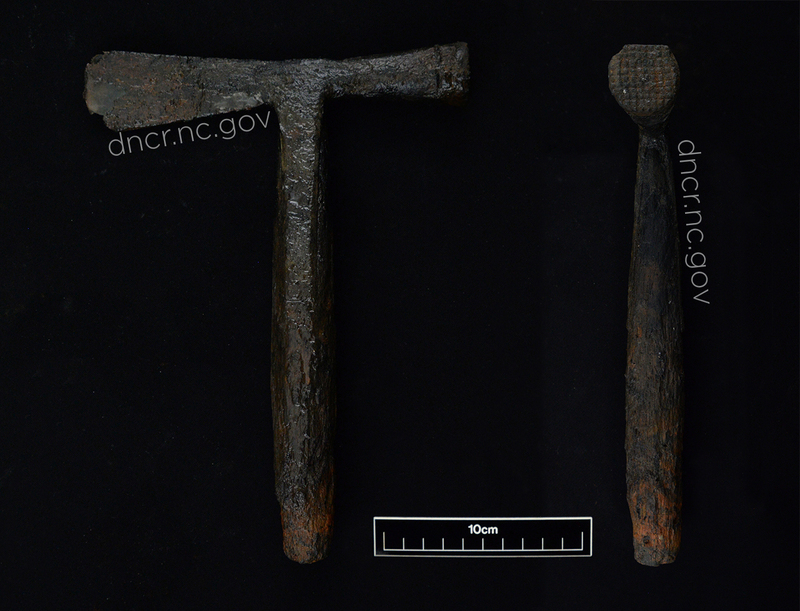 The multi-purpose nature of hammers led to 18th century toolmakers producing many types of hammers – and in fact none of the QAR’s hammers repeat in form and function. Often the same tool would serve two purposes, either end being used for a specific task. 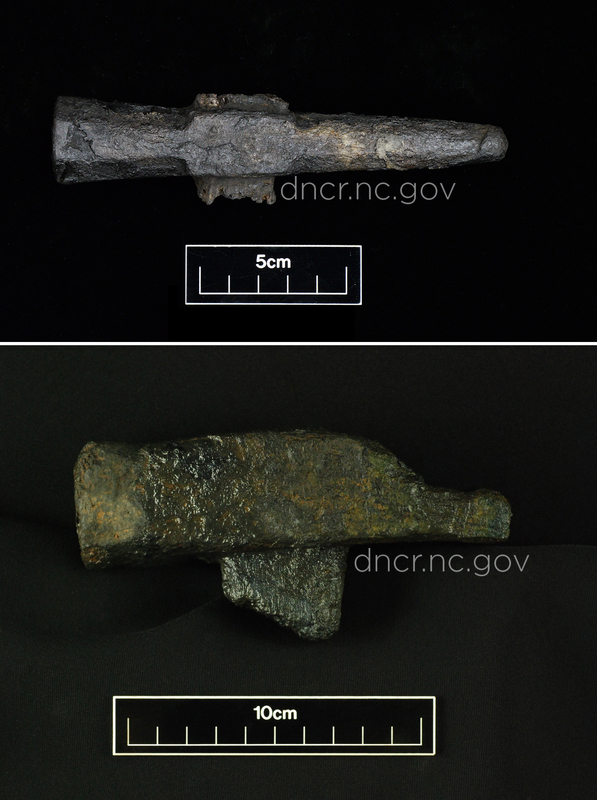 To date, five hammers have been removed from concretion, and are either in, or have completed, conservation. All of these hammers are unique in size and function, but in general they are all made from iron and have wooden handles. One of the first hammers uncovered and conserved was a simple claw hammer, the head being used for pounding nails, the claw being used to remove them. Paint it pink and add some white polka dots and you have the same hammer we use at the Lab! Next on our list is a multi-purpose tool which could have been used either as a caulking, sheathing, or lathing hammer. When used for caulking, the hammer was used to make the seams in wooden ships watertight by driving fibrous, malleable materials such as hair and pitch into the seams between boards. Evidence of this caulking is found in the QAR’s lead patches which have hair imbedded in them. QAR also has what is most likely a ships maul. These were used to drive pins; and according to the Australian National Maritime Museum, for “”breaking a shackle,” i.e. knocking out the pin to open it.” Rounding out our collection are two sledge hammers, one of which was probably used for metal working. The QAR Lab may be able to increase its hammer inventory as x-rays indicate there are possibly two hammers still in concretion. 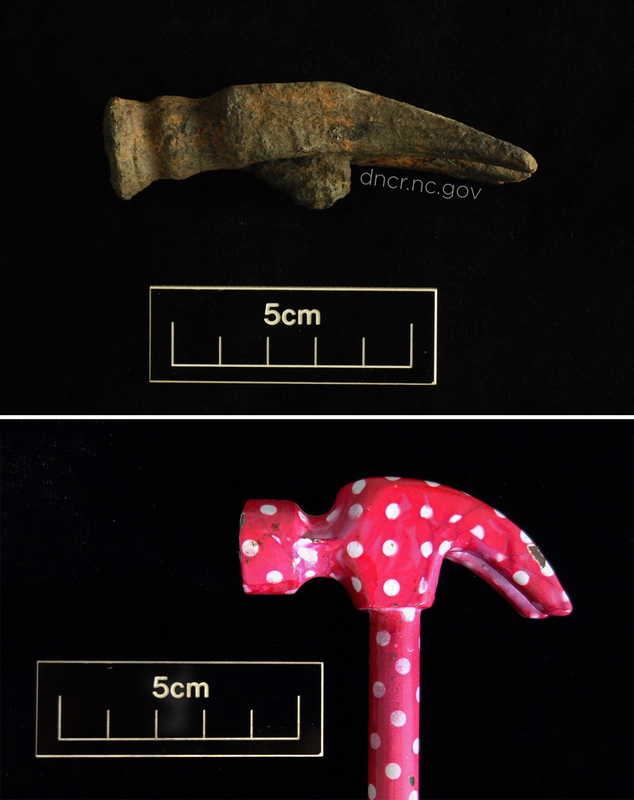 As you know from the blog on x-rays, these objects may be hammers, or two totally unconnected objects lying on each other masquerading as hammers. Only time and air scribes will tell. -"Hammers." The Colonial Williamsburg Official History & Citizenship Site. 2018. Accessed January 31, 2018. http://history.org/Almanack/life/tools/tlham.cfm. -"Shackle-Pin Ship's Maul Hammer." The Collection - Australian National Maritime Museum. 2013. Accessed January 31, 2018. http://collections.anmm.gov.au/en/objects/details/188587.